What is a probiotic and how does it help my body? Probiotics are live, “good” bacteria that help keep your body healthy. Our body has a balance of “good” and “bad” bacteria. When “bad” bacteria outweigh the “good”, we can feel unwell. In order to restore balance, supplemental “good” bacteria can help. Probiotics help renew the normal friendly bacteria that has been lost – allowing you to feel better while you’re getting better. Why do high cell count and type of bacteria matter for a probiotic? Should I take Florajen Probiotics only when I'm on an antibiotic or can I take them regularly? Many people take Florajen every day, while others take Florajen whenever they feel their digestive system needs a boost. Two main reasons to consider taking Florajen Probiotics are for helping to avoid antibiotic side effects and maintaining everyday health. Antibiotics don’t discriminate between good and bad bacteria, they kill both, and disrupt the natural intestinal and vaginal microbial balance. Florajen Probiotics help restore the good flora and maintain the natural microbial balance the body needs to stay healthy. Florajen Probiotics are also helpful for maintaining everyday health. Your body needs to be continually balanced and nurtured, and Florajen helps your body maintain an internal microbial balance, particularly in your digestive and vaginal tracts. How do I take Florajen Probiotics? Take 1 capsule daily with or without food unless a higher serving is recommended by your healthcare professional. For children under 6 months old, please check with your healthcare professional before use. If taking with an antibiotic, take Florajen at least 1 to 2 hours before or after your antibiotic prescription. Any Florajen Probiotic capsule, including Florajen Kids, can be opened and sprinkled into cold food or beverages. How should I take Florajen Probiotics with an antibiotic? 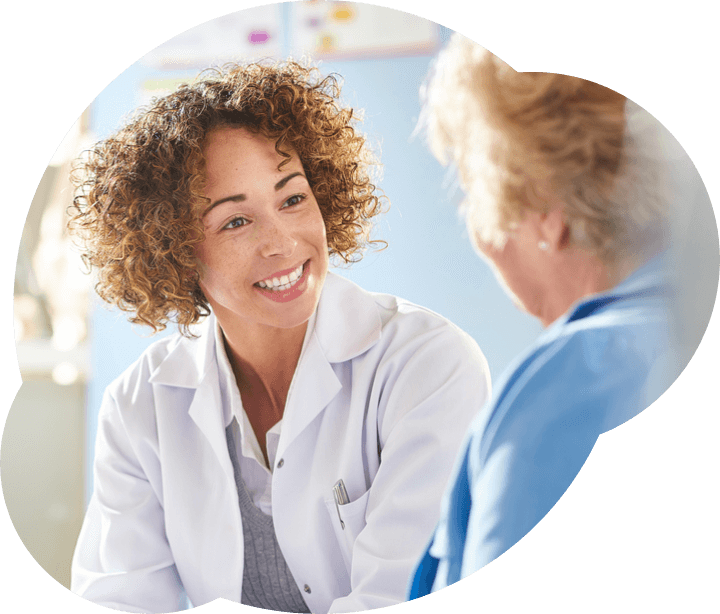 Take 1 capsule of Florajen with or without food at least 1 to 2 hours before or after your antibiotic dose unless a higher serving is recommended by your healthcare professional. Continue taking Florajen for at least 2 weeks after your prescribed course of antibiotics. For children under 6 months old, please check with your healthcare professional before use. What if I can't swallow capsules? 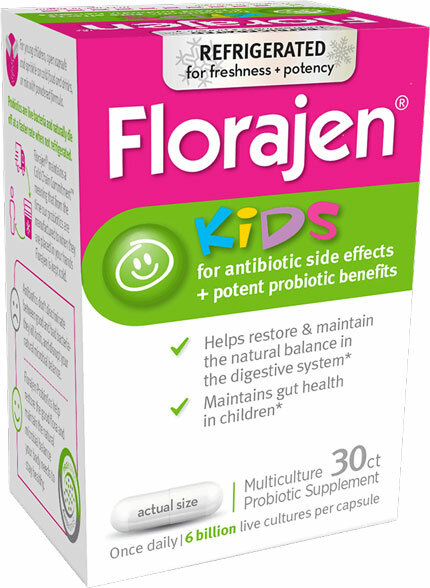 All Florajen Probiotic capsules, including Florajen Kids, can be opened and sprinkled into cold food or beverages. How old does a child have to be to take Florajen Kids? Florajen Kids is recommended for children 6 months and older. For children under 6 months of age, please check with your healthcare professional before use. Should I take Florajen Probiotics when I travel? Yes. Traveling usually means being off of your normal routine, eating different foods, and maybe at different times, which often leads to irregularity or uncomfortable digestive issues. Florajen Probiotics are helpful for maintaining everyday health. Your body needs to be continually balanced and nurtured, and Florajen helps your body maintain an internal microbial balance which is essential for good health. Why are Florajen Probiotics refrigerated? Probiotics are live bacteria, and when left unrefrigerated the cells naturally die off at a faster rate. Florajen maintains a Cold Chain Commitment™ meaning that from the time our probiotics are manufactured, delivered to the pharmacy, and placed in your hands, Florajen is kept cold. This ensures product potency and allows the cell counts within Florajen Probiotics to remain as consistent as possible through the expiration date. Florajen should be refrigerated for maximum freshness and potency. It can be stored at room temperature for up to two weeks and still maintain effectiveness. How long can Florajen Probiotics be unrefrigerated and still be effective? What are the side effects of Florajen Probiotics? Some GI discomfort can occur when taking probiotics, are usually transient in nature, and resolve within 2 weeks. Please consult a healthcare professional if symptoms worsen or persist. 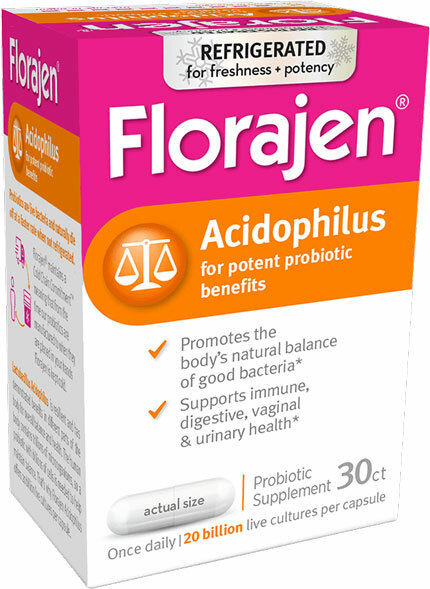 Where can I purchase Florajen Probiotics? 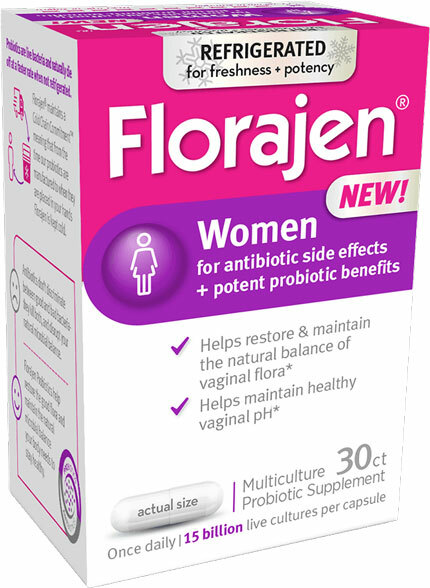 You can also purchase Florajen Probiotics at our Amazon store. Yes, all formulations of Florajen Probiotics are gluten-free. Yes, all formulations of Florajen Probiotics are certified kosher (Ko Certification). How are Florajen Probiotics manufactured? Florajen Probiotics are manufactured in the USA in GMP-certified facilities. Do Florajen Probiotics contain coloring or preservatives? No, Florajen Probiotics do not contain coloring or preservatives. Our products do not contain any of the primary allergens identified by the FDA to be listed in product ingredient disclosures including milk (dairy), eggs, fish (e.g., bass flounder, cod), shellfish, tree nuts, peanuts, wheat, or soy. I purchased Florajen Probiotics online, how do I know the refrigeration was maintained? What if my product was warm/hot when I received it? Online purchases of Florajen Probiotics should arrive in a container with insulation and freezer brick to maintain freshness and potency. If your package arrives and the ice packs have melted, please note that Florajen Probiotics can be stored at room temperature for up to two weeks and still maintain effectiveness. If you have concerns about how your shipment arrives please contact our consumer care. The Florajen Digestion, Women, and Acidophilus products are made in gelatin capsules and those capsules are considered to contain animal derivatives.